Looks like I'm off to order my 3rd Great-Grandfather's submitted Declaration of Intent & Character Reference Report from Ontario County, New York. He is one of my biggest brick walls. Born somewhere in Ireland between 1807 - 1815 (averaged by various vital records), Richard married Anna Brady in Rochester, Monroe, New York on 30 Mar 1846. Richard & Anna traveled around New York (Ontario & Orange County mainly) while their family grew to 9. They finally settled in Rochester, Monroe, New York in the late 1860's and started a coopering business. 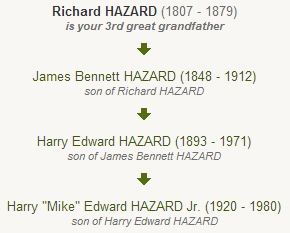 I have researched several clusters of Hazards living around Rochester, New York over the last few years but could not 100% confirm any relationship to Richard Hazard. I was excited to see another Hazard on the list. Perhaps John F. Hazard is his father, a brother, or maybe a uncle or cousin.I am so excited to get my hands on this file!! Fingers crossed my Hazard brick wall comes tumbling down before my summer road trip to Monroe County, New York. I just might have to schedule a detour to Ontario, New York as well. Have a wonderful weekend researching!! I love late night finds!